I adapted the play dough recipe from Fairy Dust Teaching. 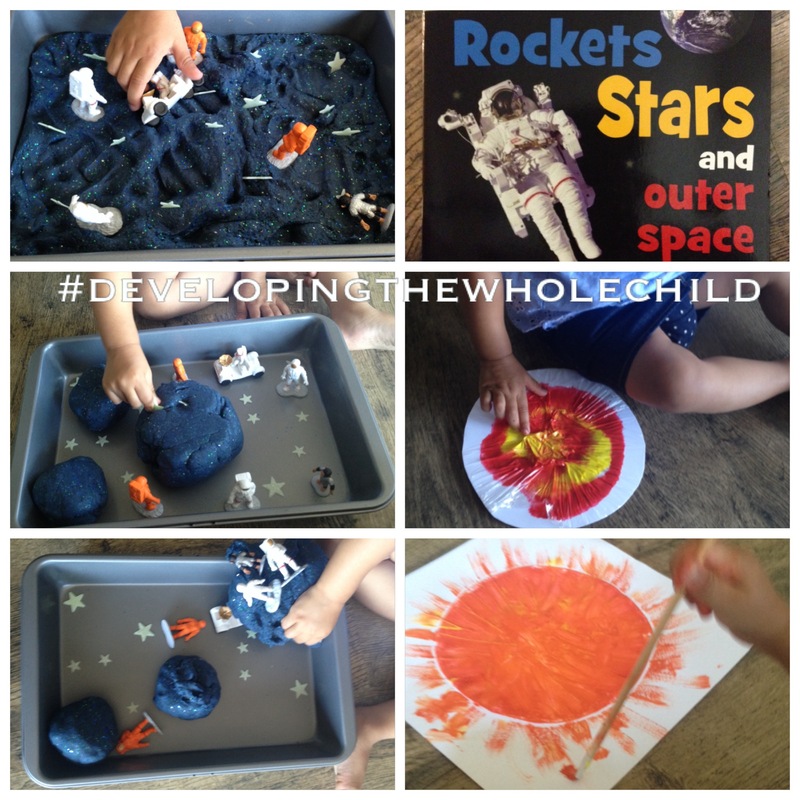 Here’s how to make this awesome outer space play dough at home! Mix liquid ingredients in a large pan. While heating liquids on medium-high heat, mix dry ingredients together in a bowl. Add dry ingredients to the heating liquids. Stir well to mix all the ingredients and the dough begins to thicken. Once the dough develops a sheen, take it off the heat and let it cool slightly (I rolled it out on a metal cookie sheet to cool more quickly) and then knead the dough well. The dough can be used again and again so long as it is stored in an air tight container or ziplock bag. a. Creative Writing. Use the play dough sensory play as a starting point to encourage and older child to write a story. Have beginning writers illustrate their own stories and you can scribe for them. b. Bake it Together. Involve the child in the play dough making process. Have him/her measure out the ingredients with you and practice mathematical skills. 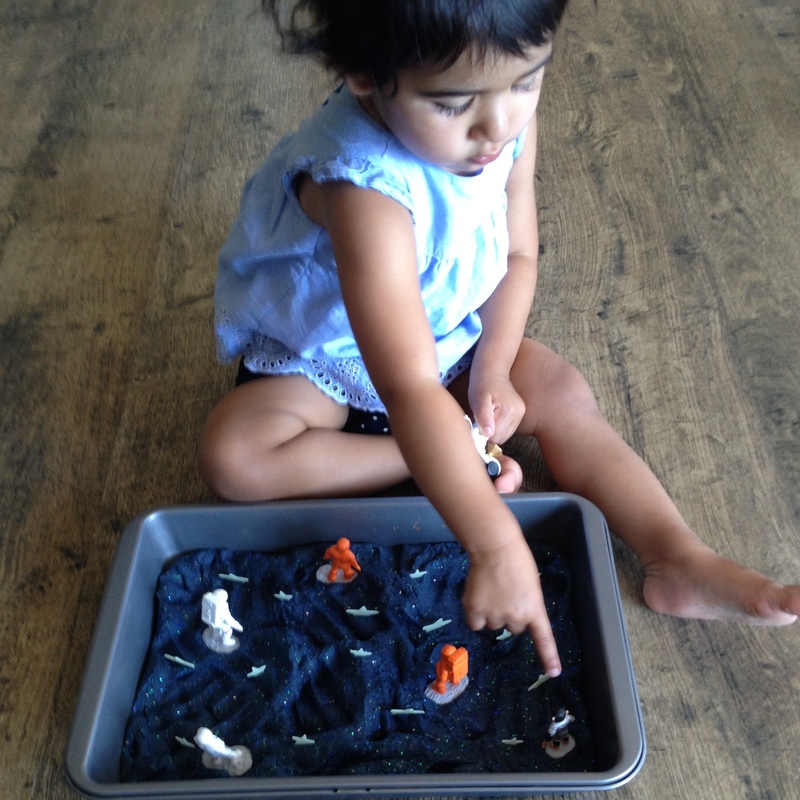 Allow the child to knead the dough with you and promote fine motor muscle development. I put a swirl of yellow and red paint onto a circular piece of white card stock and covered it with plastic cling wrap. R smothered and squished the paint around with her hands and yes, even her feet! 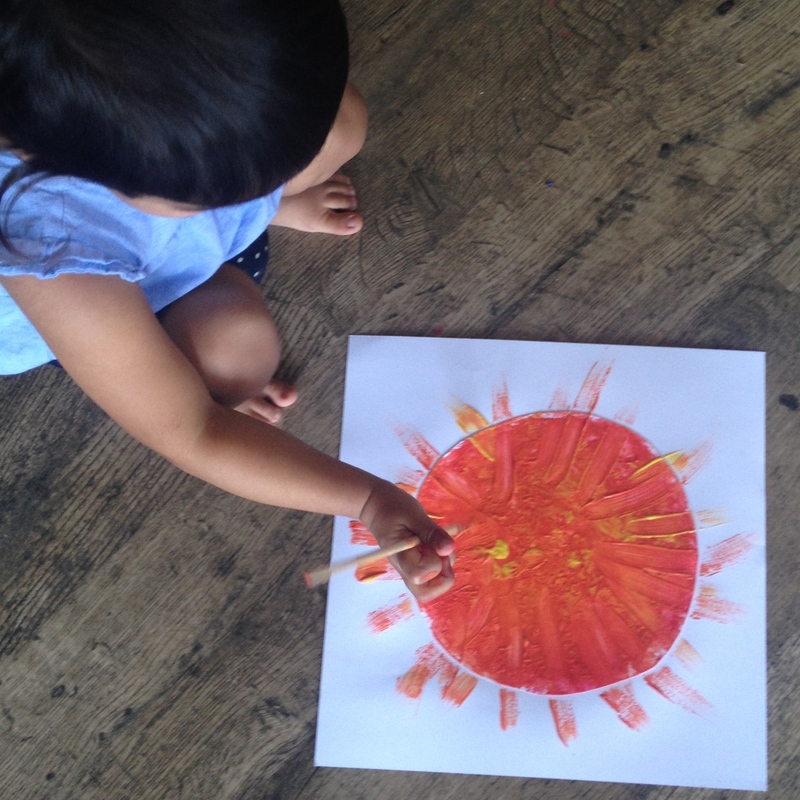 After she was done, I glued the sun down onto a square piece of paper and while the paint was still wet, I gave R a paint brush and I helped her add rays around the sun. We sang “Mr Golden Sun” while painting. a. Make foam shapes (a sun, person and tree) to go along with the Mr. Golden Sun song in order to engage the child more. Also add actions to the lyrics. When teaching songs to young kids, adding actions and/or graphics to go along with the son,g helps to stimulate the motor and visual pathways of the brain (along with the auditory) and thus, makes the song more memorable for the child. b. Explore books that show the theorized colours of the different planets. Create a whole solar system using this method of painting. Older children can gain more from the experience by also proportionally sizing their planets. Since I can’t possibly try out every single activity I have seen or thought up, I wanted to highlight some awesome ideas I had seen other moms do. This first one comes from a mom I connected with on Instagram! You can view Becky’s original post here. 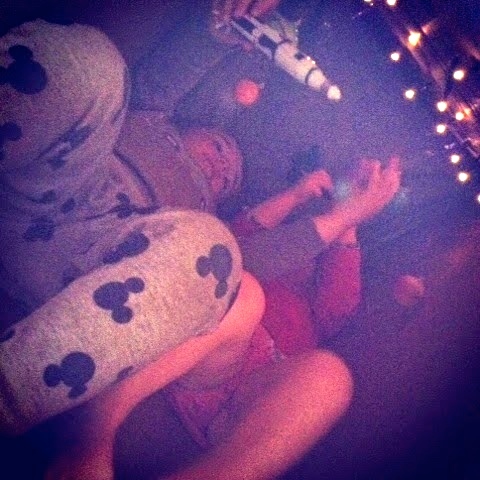 She created a fabulous space tunnel using a large cardboard box, battery operated fairy lights and plastic planets and rockets and her kids had an absolute blast in there! a. Allow an older child to look at images of our solar system and help him/her correctly orient the planets within the cardboard box. b. Perform a Puppet Play. Encourage the child to orally tell a story about being in outer space and have him/her use the plastic rockets and astronauts or homemade puppets to enhance the story. ← Top Stay-At-Home Mom Blogger Nomination!! Please Vote for Us! Great ideas! 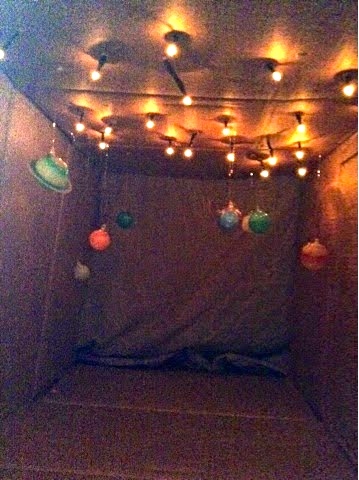 I love the idea of the starry play dough! Thanks!! My husband and I also loved playing with it!! Such a nice texture and smell.